1. High output industrial used for wood, straw, cotton stalk, rice husk, peanut shell, bamboo, empty fruit bunch, pulverized coal and waste paper etc. 2. Gearbox of pellet machines running by high precision gears, automatic lubricant pump working between gearbox and main shaft bearings to guarantee the long service life of bearings. 3. 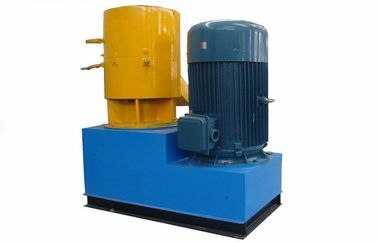 SKJ350 is driven by 30KW electrical motor. 4. Roller and die are made by quality steel materials, the service life is 2000 hours. Apply to mass production of wood fuel pellets. Suitable materials: nearly all kinds of wood sawdust, cotton stalk, peanut shell, coconut shell, bamboo, empty fruit bunch, pulverized coal and waste paper, ect. 3. With high density, high fuel value, low moisture and low ash content output pellets. 4. Structure is closely, easy to use, run stably, machines running by reduction gears.